What do you want from a one-page guide on Social Networking Sites? Social Networking Sites (SNS) are pretty complicated things. If defining them isn't tricky enough, trying to create a one page guide that communicates all the salient facts about Social Networking in general, and a social networking platform in particular, is turning out to be very tricky indeed. For the research I'm carrying out into how Youth Workers can support young people's interaction with online social networks, and for a workshop next week, I've been trying to explore the common features, and the specific features, of different SNS in order to be able to support an informed discussion about the opportunities and risks each present. Are our concerns about SNS linked to a specific feature of a specific site? Or are they linked to some common and integral feature of all SNS? What aspects of SNS design maximise opportunity and minimise risk? Are there some features of some SNS that mean the responsible adult simply can't engage with young people on that site? Or are there specific features that oblige responsible adults to engage with young people in that space? What does a youth worker need to know about SNS to be able to support young people's use of them? Do they need to know about each specific SNS? Or is some general knowledge enough? As you'll see from the image above and the attached first draft of a general SNS one page guide, and a specific guide for Facebook, when I've tried to provide something to answer those questions, I've been realising it probably won't fit into one page – and the guides have been somewhat loosing the simplicity that I hope was a virtue of earlier guides in the series. 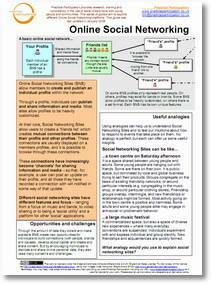 What would you want in a one page guide about Social Networking Sites in general? 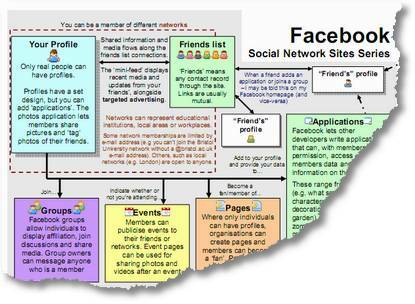 What would you want in a one page guide about a specific Social Networking Site? Whilst I can't promise I'll cover exactly what you want – I can try to make the guides flexible enough so that you can adapt them to meet your needs. And as an extra question (I'm already leaning towards an affirmitive answer on this): should I ditch the diagrams currently in the draft guide? They carry a lot of information – but I'm not sure that they make it very accessible. What do you think? Tim, this is a great start, and it’s a really worthwhile task. Maybe the thing to do is to identify the really important stuff in social networks. But what are they? Ways of connecting with people? Perhaps by distilling it down to the really key features, you might be able to squeeze it onto one side? That is indeed the really interesting question. If I avoid saying the essence of and SNS is the ‘social graph’ and all that means – I’m finding I get drawn towards enumerating features – but then no particular feature really ‘defines’ an SNS – or captures everyone’s experience of SNS. Hmmm, I really am seeing why defining SNS is so tricky… I guess it’s like trying to define ‘what is the internet’ whilst giving a //sense// of what the internet means to it’s users at the same time. Not all that possible a task? I think the most important thing for me is to have something to give to both youth (and parents) that gives an overview of what it is, as if they had no experience with them at all. The one-pagers seem helpful because they aren’t a big time commitment to absorb (much like sns content), and they establish a primary glossary for conversations between age groups. Maybe it’s the Canadian experience? I know that in the UK, you are much further ahead in the process of integrating and capitalizing on technology than we are here. Next Next post: Should local authorities be on MySpace or Facebook?